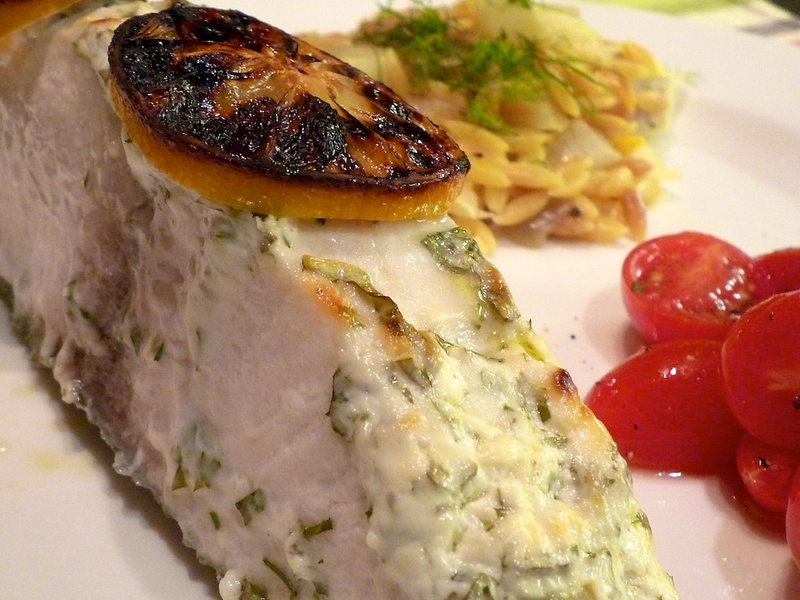 I can’t take the credit for finding this wonderful Greek-Style Mahi Mahi recipe (thanks Kirk!) but it fits perfectly into my game. Originally published in Gourmet last year, it’s very simple to make and boasts dramatic, rich flavors. While most Greek Mahi Mahi recipes I’ve found call for Kalamata olives to add the Mediterranean punch to the dish, this one focuses on rich, salty feta. This is made into a simple aioli that is smeared atop the fish prior to cooking under the broiler for a mere 15 minutes. The resulting tangy dish is stupendously good. Even more delightful is the acidic marinated tomato that accompanies the fish. As written, the recipe calls for medium tomatoes cut into wedges, but I used grape tomatoes. (In part, because I like them and, in part, because they were on sale.) For the sake of simple meal planning we served, as suggested, over a bed of toasted orzo with saffron and fennel. The recipe reviewers are right: the dish doesn’t brandish a lot of gusto. But I didn’t expect it to do so. Saffron and fennel are delicate flavors that, used here, are a gentle backdrop for a very piquant fish. Domestic Mahi Mahi, if troll or line caught, is a very responsible choice when it comes to environmental concerns. If you can’t get a fish specifically caught with these techniques, look for any from Hawaii or the U.S. which are typically caught with a long line. The fish is a moderate source of mercury and there is some debate on the frequency with which it can be safely consumed. To be save, I advise sticking to the Real Simple guidelines (based on both environmental and health factors) and limit Mahi Mahi to a once a month treat.